For years, Intel has talked about using its chips to power smartphones. Now it actually has something in its hands. At the Consumer Electronics Show in Las Vegas, Intel is showing a working reference design that it is offering to any phone maker that wants to use its chips. 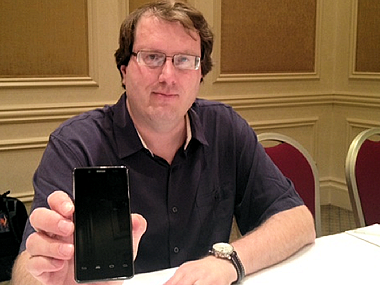 The phone itself packs a 1.6GHz single-core Atom chip along with an array of sensors and radios. “The sample platform we have is fully buzzword compliant,” General Manager Mike Bell said in an interview. The company has been testing thousands of phones internally and says the performance is top of class, with battery life at least as good as most Android devices. “We are not the best at power, but we are definitely very, very competitive,” Bell said. Compatibility is another issue that Bell said he is asked about a lot. Nearly all Java-based Android apps should run, as well as a good number of those designed specifically for chips based on cores from rival ARM. “We think that gets rid of the last argument people have,” Bell said. Of course, Intel faces plenty of competition in the phone chip space, including existing Android chip providers Qualcomm, Nvidia, Texas Instruments and other challengers, such as Broadcom. Intel is announcing two phone customers running its chips — a Lenovo phone for China slated to be released in the first half of the year and a multi-year, multi-device alliance with Motorola Mobility that will begin with a phone in the second half of the year. “You can imagine our business is all about scale,” he said, declining to say how many phone designs are being built around its chips, or how many customers it has. In a roundtable with reporters, Motorola CEO Sanjay Jha said he was attracted to the chipmaker by both its roadmap and its approach, which focuses as much on running multiple instructions on a single chip core as it does on packing in as many cores as possible. “What they have done is multithreading vs. multicore,” Jha said, noting there is a big debate in computer science as to which is better. Jha said that, along with other innovations like three-dimensional transistors, this will be important as the laws of physics prevent rapid performance gains just by shrinking the size of transistors. Intel has focused its phone efforts entirely on Android for now, noting that it believes it has more people working on Android than Google does.